A view down Main Street in Bangor as another snow storm begins Monday morning. 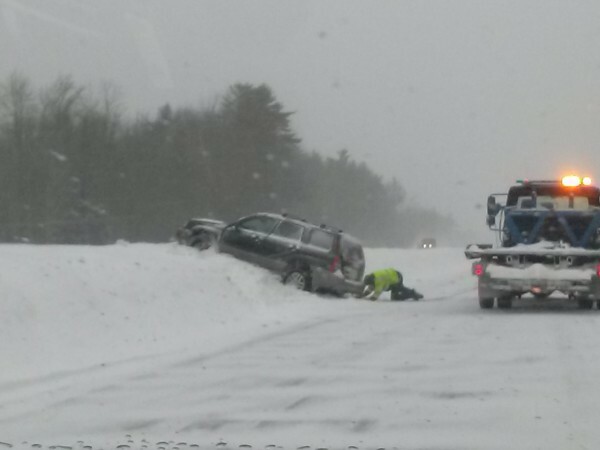 State police were reporting multiple slide-offs along the Maine Turnpike on Monday. CARIBOU, Maine — Winter-weary Mainers likely reveling in the New England Patriots’ Super Bowl victory awoke Monday to more snow falling, which will be a common sight throughout the day. The National Weather Service reported snow will become gradually heavier throughout the day, with the coast getting hit the hardest. According to the weather service’s Gray forecast center, 10 to 14 inches of snow is expected in coastal communities, with 10 inches forecast for the Bangor and Portland areas. The weather service has issued a winter weather advisory for northern and western counties, while the remainder of the state is listed under a winter storm watch. In addition to snow, temperatures are expected to remain very low throughout the day, with a majority of the state not expected to get out of the single digits. The weather service is expecting Monday evening’s commute to be difficult as the storm intensifies. Snow was expected to subside by midnight. The storm was once again hampering service at the state’s major airports, with Portland International Jetport reporting several canceled arriving and departing flights. Bangor International Airport reported one canceled departure for Monday, along with two arriving flights. The Bangor Water District is advising that residents clear areas around fire hydrants so they can be easy to locate in case of emergency. The water district is responsible for shoveling out 1,100 hydrants in its seven-town service area, but assistance from the public helps in assuring access to the hydrants. The storm also is wreaking havoc on the state’s highways, as a tractor-trailer and car collided at mile marker 13 of the Maine Turnpike in York, according to Department of Public Safety spokesman Stephen McCausland. That crash was reported at 11:15 a.m., and two of the three northbound lanes were blocked for a period of time. The tractor-trailer, driven by 74-year-old Theodore Banks of Virginia, was driving too fast for the road conditions, according to McCausland, and struck two cars after coming up behind them. The cars were following a snow plow, McCausland said, and the tractor-trailer jack-knifed and blocked two of the three northbound lanes. Neither Banks nor the drivers of the cars, Thomas Kwok of South Portland and Samuel Farmer of Florida, were seriously injured. State offices in all counties except Aroostook were to close for the day at 2 p.m., while Portland’s scheduled City Council meeting has been postponed to Feb. 9. All city offices closed at 1 p.m. In Bangor, the city government canceled all committee meetings scheduled for Monday night and announced that City Hall would close at 2:30 p.m. because of severe weather conditions. 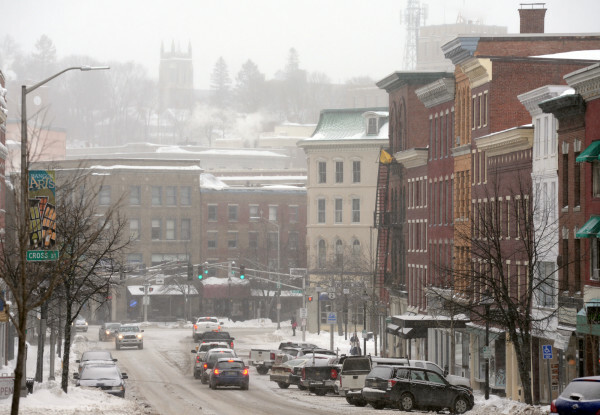 Meanwhile, Bangor Public Works Director Dana Wardwell announced a downtown parking ban effective from 11 p.m. Monday to 6 a.m. Tuesday to allow for snow removal. Vehicles parked downtown during the ban are subject to towing at the owners’ expense. Despite heavy snowfall over the past two weeks, Wardwell said the city still has plenty of space to deposit snow at its snow-dumping ground in Hampden. BDN reporter Evan Belanger contributed to this story.